Bye bye Elliott Jaques, it’s been fun but it’s time to part ways! What type of organisation do you see before you if I tell you that there is no top down strategy, no pre-defined roles, no budgets, no performance targets, full transparency and sharing of information (incl. financials), self-organising teams, fully decentralised decision-making, and where change management is a superfluous concept? Does a vision of some hippie commune, Kibbutz style co-operative emerge or perhaps a not-for profit charity type organisation? What if I then say that it is not only a single organisation but a suite of very successful organisations ranging in size from around 100 employees to 10s of thousands of employees, across industries and in both the not for profit and for profit sector? Perhaps you are asking yourself how you could run a large organisation without the foundations; a clear strategy, clear roles and accountabilities, levels of authority, defined performance targets cascaded down the organisation to measure how well strategy is executed, a well-developed project management framework with its associated budgets and Gantt charts, annual performance reviews and all the other practices we’ve been conditioned to believe are essential. In his book “Reinventing Organizations”, Frederic Laloux has researched organisations that operate from level of consciousness that represent a significant shift. He categorises the practices of organisations using a spectrum of colours to represent the level of consciousness that shapes the organisational mindset. 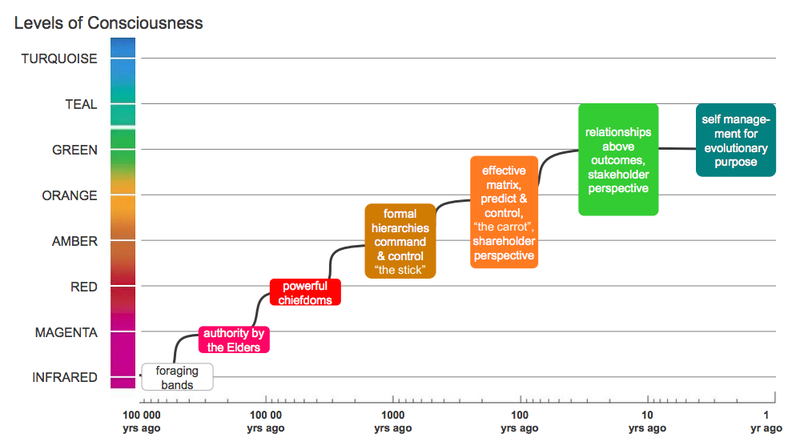 Plotting the successive stages of human and organisational consciousness on a timeline, the results tell a clear story; evolution seems to be accelerating, and accelerating ever faster. We have according to Laloux never been in time where so many people operated from some many different levels of consciousness at the same time. The same is true for organisations, Red, Amber, Orange, and Green Organisations are found working side by side in the same cultures and cities. The difference between the organisations that Frederic Laloux has researched for this book and most other organisations today is not only stark but also incredibly exciting – not only is there is a better way, but there is plenty of evidence of its positive impact on people and its longevity. Now here is the catch – you will only see the potential and the power of these practices if your adult development stage aligns with this worldview. As humans, we develop in stages, just as a caterpillar through sudden transformations becomes a butterfly, or a tadpole a frog. A key aspect of human development stages is that there is nothing inherently better or worst being at any level – it makes no sense saying that an adult is better than a toddler. However, depending on the task a certain stage may be a better fit. I have referred to adult development in previous posts, click here for link. For anyone familiar with the Cynefin framework it quickly becomes evident that the practices that these organisations share are well suited for operating in complex environments. There is an incredible shared sense of purpose, which guides decision making on a day-to-day basis. There are also just a few clear and simple rules or principles that guide what is acceptable behaviour. This allows for initiatives to emerge and if there is merit in them, people will naturally support them and give them their energy. Because decision-making is so inclusive and closely tied to the organisational purpose, change does not have to be “managed” in the way we think about it in traditional organisations. Below are some of the practices that are common and represent what Laloux refers to as Teal Organisations. If you read these and think – how crazy, could never work, maybe it is time to reflect on your view of people – are you a Theory X or a Theory Y supporter? Each level of consciousness has brought with it some breakthroughs compared with the previous level. For Teal organisations these are; Self-management, Wholeness, and Evolutionary Purpose. The following is quoted directly from a summary of the book by Ulrich Gerndt from Change Factory. Self-management: operate effectively, even at a large scale, with a system based on peer relationships, without the need for either hierarchy or consensus. Wholeness: practices that invite us to reclaim our inner wholeness and bring all of who we are to work, instead of with a narrow “professional” self / “masculine resolve” etc. Evolutionary Purpose: organizations seen as having a life and a sense of direction of their own. Instead of trying to predict and control the future, members of the organization are invited to listen in and understand what the organization wants to become, what purpose it wants to serve. This book really shifted my thinking about organisations and leadership; maybe I read it at the right time in my life and/or at a juncture where my understanding of complexity was sufficient to enable this shift. Either way, it was the straw that broke the proverbial camel’s back with respect to my long-standing relationship with Elliott Jaques and structured hierarchy. The more I am learning about complexity the harder this relationship has become. Faced with evidence that disprove my current view – I now have to dismiss some of the concepts I have been working with and often promoted for a long time, or at least recognise their limitations in complex environments. I had an exchange with Jurgen Appelo a few months ago where we debated the idea of levels of work in manager – subordinate relationships. Jurgen has for a long time argued that management is too important to leave to the managers, I now feel that I have a much better idea of where he is coming from. I still maintain that people have different levels of capability and that a successful outcome is to some extent dependent on a good match between complexity and capability. However, this does not have to be formalised through a hierarchy with defined role vested authority and accountability, personally earned authority seems to suffice. Collectively we are smarter than any individual is and not many complex tasks are completed in isolation from everyone else in the organisation. “Top leadership: The founder or top leader (let’s call him the CEO for lack of a better term), must have integrated a worldview and psychological development consistent with the Teal development level. Several examples show that it is helpful, but not necessary, to have a critical mass of leaders operating at that stage. .
All the adult development theories I have come across suggest that only a relatively small percentage of the adult population is at a post-conventional or in a later developmental stage akin to that of Teal Organisations. Possibly even fewer in leadership positions where they could affect any change. Most operate from a conventional stage and hence we have so many of the achievement driven organisations we see and potentially work in today. So perhaps given that last paragraph I should not totally give up on all of the ideas and concepts from RO and Systems Leadership Theory, some may have a place in making orange and green organisations better in some ways even if they will not guide us into Teal territory. Interestingly though the language in the title of the book is very much from an Orange Achievement lens rather than a Teal one. Perhaps children growing up in today’s hyper connected, peer sharing world will be naturally drawn to organisations where Teal practices are in place? For my own son’s sanity I really hope he does not have to suffer through the same level of corporate BS that his parents have (and are still dealing with). For Deming performance appraisals and the often subsequent, employee ranking, is one of the seven deadly diseases of management. He also insightfully told us to get rid of numerical targets and work quotas, clever fellow Dr D.
As you may know I am a big fan of Elliot Jaques and his seminal work developing a comprehensive coherent organisational theory. I’m afraid it just does not stack up, it is way too simplistic in today’s complex business environment. 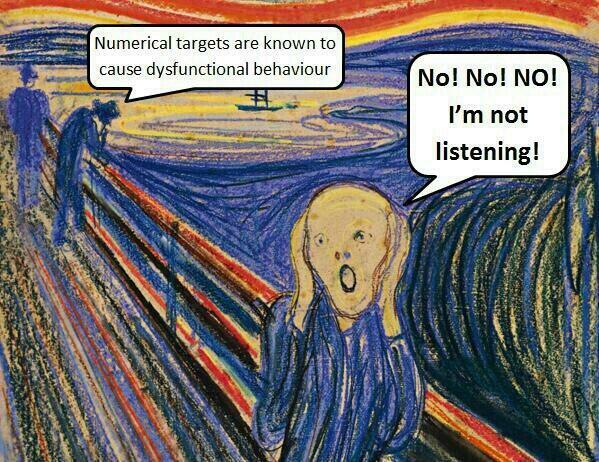 Firstly all targets are arbitrary so measuring performance relative to an arbitrary target is just as arbitrary. Secondly, I most likely work in a system that has been designed by someone else (if at all, it may just have emerged over time) so it constrains my ability to perform, meaning there is inherent unfairness in assessing my individual performance as measured by output. Dr Deming’s 95-5 rule highlights the impact of the system on performance vs. the impact of the individual. Of course this is not a literal rule but it is clear where the greatest leverage for improvement is. I agree wholeheartedly that feedback is essential but I think annual reviews should be banned; they have no place in a modern organisation. I really do wonder for whom they are valuable, not once have I heard a manager nor a staff member even hint at getting any value from them. Someone in HR however, most likely with a nonsense target about how many have been done, harasses anyone who still has not completed this complete waste of time. Often the design of performance management systems are delegated not only to HR, but to a level in HR that is too low to understand the true complexity of the task. We end up with a process-laden system that assumes there is true objectivity in numbers and targets as measurements of performance. Of course we all need to know what is expected of us in our role and how we are going. That bit goes without saying and I think your 8 questions go some way to improve the feedback process and as you point out make it a more frequent occurrence. Discussing performance and the role is something that can and should happen continuously. Context changes and subsequently roles may need to be adjusted to better reflex these changes so the role description can be a live document. It is also critical that the role description outline what the expected good behaviours are for the different elements that the role is accountable for. I like that your questions are based on manager’s using their own judgments to assess performance. An often overlooked role in performance systems is the role of the MoR who plays a critical part of the overall system in that their role is to make sure the manager-subordinate relationship is fair. If you subscribe to the idea that systems drive behaviour, you have to, as a manager dig a bit deeper than the individual if you see undesired or unproductive behaviours emerge in the organisation. I wrote this entry as a response to Michael Cardus’ post on performance appraisals. performance target, friend or foe? I subscribe to Stacy Barr’s blog on performance measures and the other day she posted an entry on targets. Since I am working towards removing targets all together I posted a reply. My reply is published below and I’ll be interested in Stacey’s reply. Hi Stacey, I’ve commented on this topic before and in my view targets are a complete waste of time – we should not become friends with them we should abolish them. The negative consequences of targets and a target setting culture are quite astonishing. What is wrong with just measuring performance with the intent of learning and improving? What value does the numerical target add to this, especially since it will be an arbitrary number anyway? Any number you put up could be questioned, we need to improve by 10%, why not 11% or 9%? – the real question is by what method will we improve our performance? Even in safety with Zero harm targets which on the surface sounds admirable, the danger is that people do not report things as it will ruin the reporting. Targets motivate people – if so where is the evidence for this claim? I’ve seen much evidence to suggest the contrary, targets demotivating staff and creating a de facto purpose to reach the target regardless of broader impact, all sorts of creativity comes into play to manipulate data to reach the target. A recent report from House of Commons Public Administration Select Committee (PASC) into allegations of police mis-recording of crime statistics highlight this. I’ve borrowed this marvellous image from Simon’s twitter feed. Targets sets direction – surely a well defined sense of purpose already does this. If people do not know why they are doing something that is a critical failing of leadership. Stacey, you know your statistics so when I say that there are only three places a target can reside on a control chart you know what I talk about (assuming a stable process). 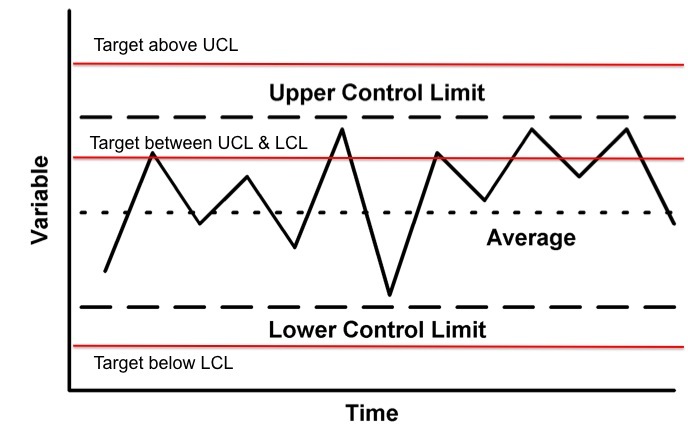 It will either be below the LCL (in which case you will always meet the target), it will be in between the UCL and LCL (in which case it will be hit and miss due to common cause), or it will be above the UCL (in which case you will never reach it with the current method). Your example of reducing the time from 24 hours to 12 hours is an interesting one, why is the average time important? A couple of complex cases and your average can blow out. You have spoken before about the need to shift the process capability and that’s a way to understand if any real improvement has been achieved. The value is as you know not in the average as such. Targets and target setting is the thinking of the command and control manager in a organisation where decision-making is separated from work. As the complexity of organisations increase and more and more work is knowledge work, managers have had to abandon the attempt to control the individual activities of their staff and stop using target-setting to try to control the organisation.